Phillies season preview: How will Gabe Kapler fill out his bench? 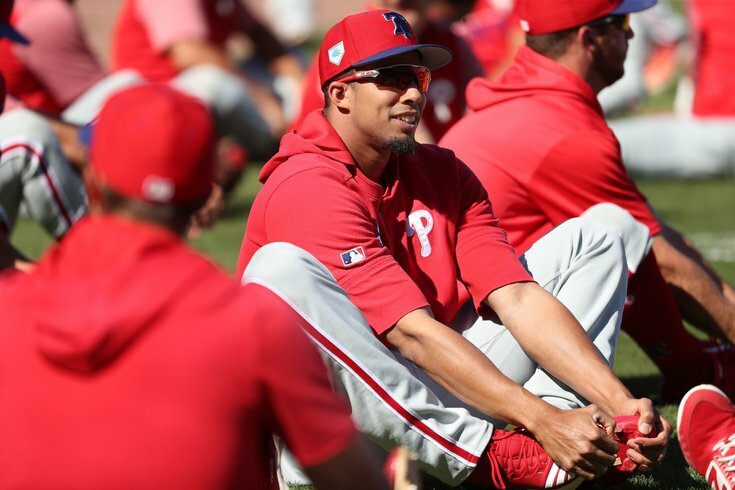 Philadelphia Phillies outfielder Aaron Altherr stretches prior to a spring training game against the New York Yankees. Over the last two weeks of spring training, the Phillies turn their prep work to get ready for the regular season into overdrive. We'll do the same thing here at PhillyVoice. As the March 28 season opener against the Braves approaches, we'll break down everything you need to know to get ready for one of the most anticipated Phillies seasons ever. The Phillies won't simply be relying on their eight regular starters, each of whom we've already previewed, to win games and make a run at the postseason in 2019. They'll also need contributions from their bench, whether it's as simple as a clutch pinch hit or filling in for an injured player on an extended basis. They're often the forgotten men on a baseball team, but they often find themselves in games in critical spots, so it's definitely worth taking a closer look at the players who will be filling out Gabe Kapler's Opening Day roster. As Todd Zolecki of MLB.com pointed out in a recent mailbag, the Phillies will likely ride an eight-man bullpen, meaning they'll have four bench spots available, with two of them already more or less spoken for. Andrew Knapp will be the Phillies backup catcher and Scott Kingery will be the team's utility infielder off the bench. That leaves two spots for three outfielders: Aaron Altherr, Nick Williams and Roman Quinn. In trying to figure out which players will be on the Opening Day roster, Zolecki also points out that the key could be in determining which players still have minor league options left on the table, meaning they can be sent down to triple-A without having to clear waivers. It is important to remember which players have options remaining -- particularly when it comes to the Phillies’ outfield and bullpen battles -- as the team finalizes its Opening Day roster. Because while it is important to put the very best roster together, it also is important to maintain depth for a six-month season in which multiple players will be injured. And when it comes to the three players listed above, only one has any options left: Nick Williams. That being said, the Phillies may not be forced to make their decision before Thursday's opener because Quinn (oblique) is expected to start the season on the injured list, giving Kapler and the Phils some time to decide what they want to do with their backup outfielders. Prior to the injury, it seemed like Williams would be the odd man out, for more reasons than just his remaining options. While both Altherr and Quinn seem capable of playing all three outfield spots, Williams is more of a corner outfielder, and that could be the difference-maker for the Phillies, considering the backup outfielders' best chances to play are in centerfield, where Odubel Herrera — and not Bryce Harper and Andrew McCutchen — holds the starting job. Of course, Williams will get some more time to show he belongs in the bigs while Quinn continues to recover from his injury. Once he returns, however, the Phillies will have to eventually make that decision. As we've do with each position, let's take a look at the numbers for each of the Phillies bench candidates. As we previously mentioned, Kingery and Knapp pretty much have their spots on lockdown. Last winter, Kingery signed an historic MLB contract before every playing a big league game. He wasn't consistent enough in his rookie season to earn a starting job and with an improved infield, he may not get as many chances as he did last year, but the 24-year-old infielder is still growing and could push both Maikel Franco and Cesar Hernandez should either of them struggle out of the gate. Knapp also struggled in 2018 as the backup to Jorge Alfaro, but could learn a thing or two from newly-acquired All-Star J.T. Realmuto. Sure, there will be an even steeper drop-off from starter to backup, but Knapp will likely only be playing once a week at most, and he still has options remaining should the Phillies decide to add a veteran backup at some point this season. After slashing .272/.340/.516 in 412 at-bats in 2017, Altherr took a major step back in 2018. But the potential is still very much there, and his proven ability to hit the ball combined with his penchant for making spectacular plays in the outfield, means he's likely going to stick around. Interestingly enough, Altherr's career has been a very up and down one to this point. For proof, just look at his season by season WAR since joining the Phillies (for real) back in 2015. If that trend continues, Altherr could be in for a big season in 2019. When it comes to Nick Williams, there's reasons the Phillies like him despite the fact that he's limited to the corner outfield spots that are currently occupied by Harper and McCutchen. The 25-year-old outfielder is the only true left-handed bat of the trio, and he played better for the Phillies last season when he was coming off the bench. But it also stands to reason the Phillies want him getting regular at-bats, something he won't be able to do at the major league level. There was also talk the Phillies could trade Williams, but nothing has materialized and the season starts in just a few days. With Quinn starting on the injured list, there's a good chance the Phillies would rather keep Williams at this point. Speaking of Quinn, it seems like he's injured more than he's healthy, and with a solid chance at making the Opening Day roster this year, the young outfielder once again finds himself sidelined. That could come back to bite him should Williams play well to start the season. Quinn showed flashes last season, but wasn't consistent (or healthy) enough to warrant an everyday spot in the outfield. At least not yet. The Phillies bench players could feel some pressure from some of the organizations top prospects this season, specifically in the form of Adam Haseley, the team's top pick from the 2017 MLB Draft. Because he was a college player, Haseley has already spent time at the double-A level and is likely going to be moved up to triple-A at some point this season after slashing .316/.403/.478 in 39 games for Reading last season. A contact-first hitter for most of his college career, Haseley's stock soared when his power from the left side started to show up as a junior. He has the innate ability to barrel up the baseball and send it to all fields. He doesn't strike out a ton and can draw walks and there's the chance for more power to come as he learns to add more leverage to his swing, something he did more of later in his first season. An above-average runner, the Phillies feel he can stay in center long term and be better than average there, though he saw time at all three outfield spots in 2018. Hasely had his moments this spring, but was overall underwhelming in his first big-league action and was recently sent down to the minors. The Phillies also have other prospects in their pipeline that will eventually push for spots beyond this year, like 2018 first-round pick Alec Bohm and 2016 first rounder Mickey Moniak, however there is something to be said for allowing prospects to develop in the minors, where they can get everyday experience rather than just random at-bat here and there. With that in mind, there's a good chance the Phillies don't call on any of these guys until rosters expand in September. But they'll definitely be pushing for roster spots moving forward and are worth keeping an eye on as they develop.